New York : HarperCollinsPublishers, 1996. This is the first edition of The Fallen Man. The dust jacket was designed by Peter Thorpe, who has designed and illustrated over 40 Hillerman editions and whose work has become the iconic imagery associated with Hillerman's novels. This 1996 edition was published by HarperCollins Publishers in New York City, New York. The book was designed by Liane Fuji. Format: Hardback, 24.3 x 16 cm. 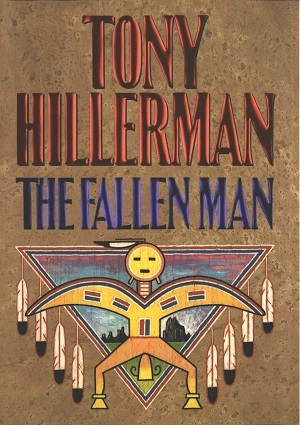 Binding: Brown boards with black cloth spine lettered in sliver: [vertically] TONY HILLERMAN [decorative device] THE FALLEN MAN | [horizontally] Harper | Collins. Decorative device using the triangle and yei figure from the dust jacket illustration embossed in red on the front cover.